What is Mastermind used for? What is the source of evidence for Mastermind? Is supplemental data from Pubmed included in the Mastermind database of scientific literature? Does Mastermind provide access to full-text articles to users without journal subscriptions? How often is the Mastermind database updated? Can results change from day to day on the same search in Mastermind? Are genes and variants cited in the tables and figures of full-text searches included in the Mastermind database? What kind of searches does Mastermind support? How can I use the Advanced Search capabilities of Mastermind? What are the differences between Mastermind Basic and Mastermind Professional Editions? What gene formats and nomenclatures are searchable in Mastermind? Do article counts include variant data only available in the full text? How can a user be sure that a zero result means there are no articles that mention the searched-for variant? How do I report a missing article or variant to Mastermind? What variant formats and nomenclatures are supported in Mastermind? How can I search for variants in Mastermind? Which types of variants can be searched in Mastermind? How are insertions and deletions, nonsense, frameshift, and non-coding variants displayed in Mastermind? Can we search variants on genomic positions in Mastermind? What is Relevance and how is it used to prioritize article results? What is the impact factor/impact plot and how can I use it to qualify or guide my results? What are the Categories in Mastermind and how can they be used? Does Mastermind include population frequency data or computational model predictions of pathogenicity? Does Genomenon provide data analytics services using Mastermind? What browsers are currently supported by Mastermind? Is Mastermind available through API access? How does Mastermind compare to HGMD for variant searching? How does Mastermind compare to ClinVar for variant searching? Does Mastermind provide variant interpretations or reports? Does Mastermind differentiate between positive and negative associations for diseases and genes or diseases and variants? How does Mastermind compare to PubMed for variant searching? How does Mastermind compare to Google Scholar for variant searching? Can I view full-text articles in Mastermind? How should I refer to Mastermind in my paper? Mastermind is a comprehensive search engine to identify disease, gene, and variant data from millions of scientific articles. These data are prioritized based on clinical relevance of the article’s content, and evidence of each match is provided in the form of sentence fragments from full text articles. PubMed and Full Text. We scan the PubMed data for all articles, along with the full text of articles relevant to genomics and mendelian disease. Yes! Mastermind has now included supplemental data into its indexing process. If you’d like to learn more, please contact us. No. Mastermind provides online access to articles if they are available to you as open access or through a subscription. If you have access to the article, Mastermind will show you the full text publication within the application. If you do not have access to the article, Mastermind will provide a link to the publisher’s site to purchase the article. Weekly. Mastermind performs weekly updates to its database by identifying the new content that has been published in the preceding week through PubMed and prioritizing this content for indexing. Yes. Because Mastermind data is updated on a weekly basis and article indexing is ongoing, new data can be added to the search results as new articles are indexed. Yes. Mastermind scans the entirety of the full-text in its search, including tables and figures. Diseases, genes, variants, and keywords. Mastermind supports searches by disease or gene. Searching by disease allows you to see all the genes and variants associated with that disease. You can also search by variants. Searching by gene or variant allows you to see all the diseases that involve the gene or variant. Each of these searches allow users to see and interact with all articles associated with these search terms. The Advanced Search capabilities of Mastermind Professional Edition support user-defined text-based queries in combination with multiparameter disease, gene, variant or keyword searches. The Advanced Search capabilities are part of Mastermind Professional Edition and can be used to search for user-defined, free-text terms in the title or abstract of any publication in addition to performing multi-parametric searches for multiple disease, gene, or variant combinations using AND or OR operators. Many. While the data content remains the same between Mastermind Basic and Mastermind Professional, there are several differences between the two versions. High-volume users with more specific analytic needs would benefit from use of the Professional Edition. The key differences are outlined here in our plan comparison. HGNC and others. Mastermind uses Hugo Gene Nomenclature Committee (HGNC; http://www.genenames.org/ ) nomenclature for gene symbol display. Additional synonyms are drawn from multiple other sources including UniProt ( http://www.uniprot.org/help/gene_name). Yes. Mastermind displays all the variants found whether they were present in the title, abstract, PubMed metadata, or anywhere in the full text. Mastermind Professional Edition has an advanced search function that allows users to switch between displaying results specifically from PubMed only versus displaying results from full-text articles. …and are assembling additional data now that speaks to the statistical confidence users can expect of a null result when using Mastermind. If an article is found to be missing or information was from the article was misinterpreted by Mastermind, feel free to reach out to us through the “Contact Us” link within Mastermind or otherwise email us at support@genomenon.com. HGVS and others. Mastermind searches the literature for any one of dozens of different variant nomenclatures – standardized (e.g. HGVS; http://www.hgvs.org/) or not. For data display, the protein co-ordinates of the variants are used preferentially to make it easier to find and interact with relevant articles, irrespective of nomenclature used by each author. Entering a gene name in the “Gene” search box on the Mastermind home page will enable the “Variant” search box. Variants can be entered by typing the variant name using HGVS (or any other valid variant nomenclatures) either in cDNA or protein co-ordinates or by rsID. Mastermind can be used to search for coding variants including missense variants; insertion, deletion, and indel variants; nonsense variants; and frameshift variants. Mastermind will also search for non-coding variants affecting 5’- and 3’-untranslated regions (UTRs), splice donor/acceptor sites, and introns as well as intergenic variants up- and down-stream of neighboring genes. The “Filter by” input in the “Variants” section of the Mastermind results page can be used to find such variants. For example, typing “ins” or “del” will filter the results for all insertions and deletions cited in that gene. Other shorthands can be used in the same way. Not yet. Mastermind does not currently enable searches by genomic coordinate. However, genomic variants within VCF files are properly annotated, and searching by genomic coordinates in the user interface has been added to our list of features to be considered for future Mastermind software releases. Want to move this feature request up in the queue? Contact us. The Relevance of an article is a measure of both clinical relevance of the article and contextual relevance to your search query. Clinical relevance is informed by the content of the article, as well as the journal’s impact score, recency of the publication, and other metadata about the article. Contextual relevance includes considerations including how frequently the selected search terms are mentioned in the text of the article, how close together they appear, and where they appear in the article. Relevance is intended to be a relative and not an absolute estimation of the relevance of the content to your search queries. This ranking is depicted in the impact plot – the size of each circle represents the relevance of the article to the selected key terms, the larger the circle, the greater the relevance. By default, Mastermind will order the publications by their relevance in the Articles List. The impact factor (IF) of an academic journal is a measure of the average number of citations for articles published in that journal. It is frequently used as an estimate of the relative importance of a journal within its field. 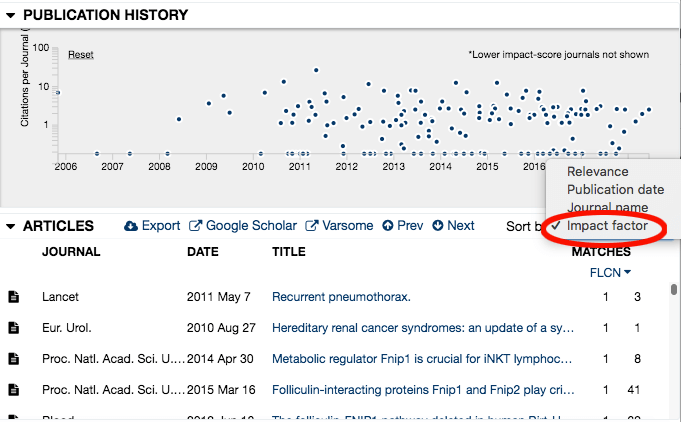 The impact factor plot shows each article by publication date along the x-axis and impact factor along the y-axis, with the relevance of the article represented by the size of the bubble. Categories are part of Mastermind Professional Edition. The default keyword categories in Mastermind Professional include: ACMG Interpretation, Clinical Significance, Genetic Mechanism and Significant Terms in Abstract. Each of these categories allows the user to display only those articles that contain content that is relevant to each individual category based on the appearance of any of the given category’s key terms. The ACMG Interpretation category contains a number of subcategories, such as Functional Studies and Segregation Information, that facilitate identification of articles useful for ACMG/AMP interpretation. The Significant Terms in Abstract category identifies keywords that are specifically associated with the content for the disease and gene in the original search. Mastermind produces this list of custom key terms by aggregating the content of each of these articles, performing a word frequency calculation, normalizing this list against the rest of scientific literature, and then ordering the terms by their frequency of occurrence in the content of interest. As an example, for the disease-gene association Melanoma-BRAF, this category includes anti-BRAF inhibitors like Vemurafenib and Imatinib, other genes such as GNAQ, and ancillary disease terms like uveal. No. However, Mastermind has a partnership with Saphetor to provide link-outs to VarSome, which aggregates much of this publicly available data. Additionally, Mastermind links out to Google Scholar for additional information from patents and conference abstracts. We have a number of partnerships that will be announced in the coming months as well. Yes. Genomenon offers gene panel design and variant database assembly, in addition to custom services in clinical NGS experimental design and drug discovery or repurposing projects. If you do not have Google Chrome installed, you can download it from https://www.google.com/chrome/ and follow the download instructions for your computer platform. Mastermind is also accessible in Firefox, Safari, and Internet Explorer 11, though some features may be limited. In addition to the published API, custom APIs are available upon request. Favorably. Mastermind is superior to HGMD based on customer feedback in multiple aspects briefly described below. Mastermind is a more comprehensive database with a better user interface and more ready access to the evidence required to make informed variant interpretations. Gene Coverage – Mastermind identifies variants in any gene in the human genome, whereas HGMD is limited to 9,000 genes. Disease Coverage – Mastermind identifies variants for somatically acquired diseases in addition to germline variants, whereas HGMD focuses on germline variants. Article Coverage – Mastermind has indexed more than 5.5 million genetic and disease-related full-text articles, whereas HGMD has indexed fewer than 100,000. Mastermind has also indexed all 30 million+ titles and abstracts from PubMed. Supplemental Material Coverage – Mastermind is launching supplemental data, which will cover more than 40,000 articles, whereas HGMD has supplemental data for fewer than 29,000 articles. Update Frequency – Mastermind is updated every week with new data, whereas HGMD is updated every 3 months. Evidence – Mastermind shows the context of gene and variant mentions, whereas HGMD solely provides PMID numbers. Interpretations – Mastermind presents users with the data required to quickly reach their own conclusions, whereas HGMD provides their own assertions which do not conform to and are not useful for ACMG-style interpretations. Favorably. ClinVar has limited reach into the medical literature, and does not yet offer a comprehensive landscape of genes or variants, as the database is dependent on community engagement. No. In contrast to ClinVar and HGMD, Mastermind does not draw its own conclusions about the clinical significance of individual variants, but rather provides the user with all the evidence necessary to make these conclusions on their own. Mastermind is therefore more properly considered a decision support tool. No. Mastermind searches for all mentions of a disease, gene or variant, but does not draw conclusions about the nature of the association between the disease and variant or gene. We leave that to the experienced curators. Favorably. 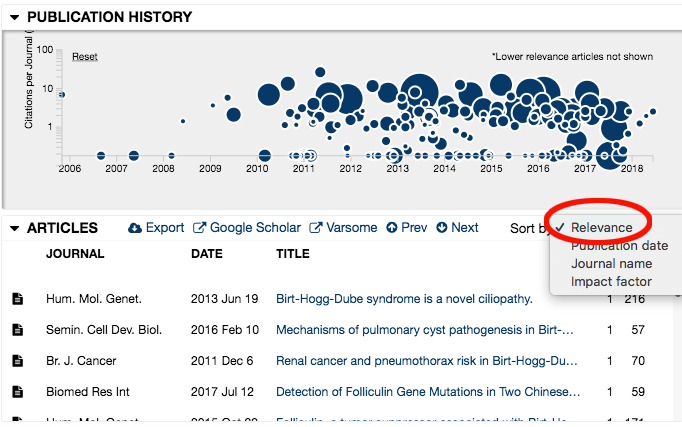 PubMed searches are restricted to exact variant matches, and the search results are restricted to variants mentioned in the titles or abstracts of articles. PubMed also does not distinguish between like variant names across different genes. Favorably. Google Scholar variant searches are restricted to exact variant matches, and the search results are not prioritized according to clinical significance. Moreover, since Google Search has limited context awareness for variants being mapped back to the correct genes, multiple false positive results are erroneously flagged. In contrast, Mastermind prioritizes the search results for specific articles based on the clinical significance of each reference. 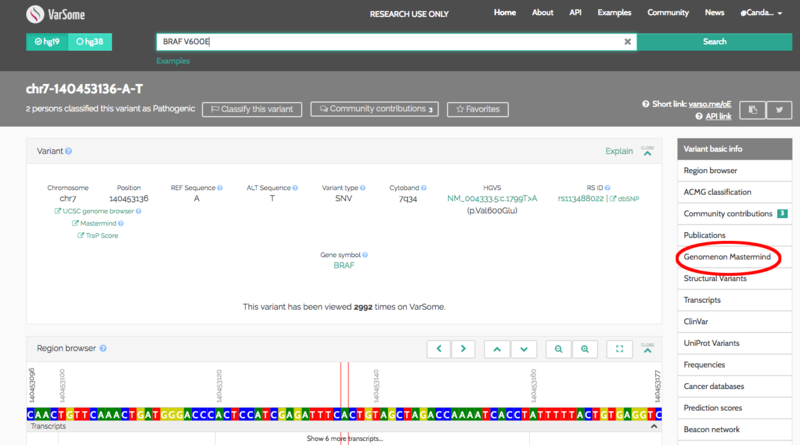 Moreover, Mastermind is aware of all the different ways authors can describe genes or variants and indexes the articles using this information so users do not need to configure these searches on their own; users can use any single nomenclature they prefer and be assured of the sensitivity of their search results. Finally, Mastermind displays the result match in the context of the rest of the article content allowing users of Mastermind to very quickly determine the accuracy of the result. Yes. As long as it is open access or you have licensed access to the text. If you do not have licensed access, Mastermind will display the match data from the full-text and will redirect you to the publisher’s website if you’d like to purchase the article or subscribe to journal access. Start with Mastermind Basic Edition today and get a 14 day trial of Professional Edition!